(Phys.org) —Thousands of shipping containers are lost from cargo vessels each year. Many of these containers eventually sink to the deep seafloor. 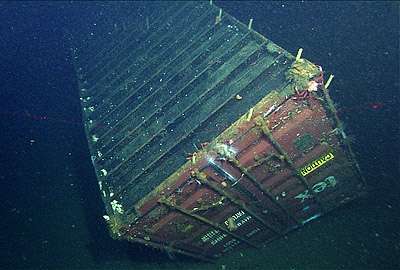 In 2004, scientists at the Monterey Bay Aquarium Research Institute (MBARI) discovered a lost shipping container almost 1,300 meters (4,200 feet) below the surface of the Monterey Bay National Marine Sanctuary. In the first-ever survey of its kind, researchers from MBARI and the sanctuary recently described how deep-sea animal communities on and around the container differed from those in surrounding areas. In February 2004, the cargo vessel Med Taipei was traveling southward along the California coast when severe winds and seas dislodged 24 shipping containers, 15 of which were lost within the boundaries of the Monterey Bay National Marine Sanctuary. Four months later, during a routine research dive using the remotely operated vehicle (ROV) Ventana, MBARI scientists discovered one of these containers on the seafloor. 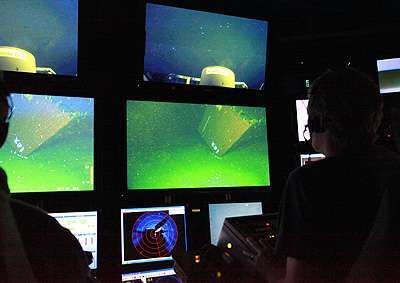 In March 2011, a research team led by Andrew DeVogelaere of the sanctuary and Jim Barry of MBARI completed another ROV dive at the container. During this dive, they collected extensive video footage, as well as samples of seafloor sediment at various distances from the container. They then compared the animals found on the container, on the nearby seafloor, and on the surrounding seafloor out to 500 meters (a third of a mile) away from the container. In early May, 2014 they published their findings in the journal Marine Pollution Bulletin. In their paper, the researchers speculate that some of these slow-growing animals might not have had enough time to colonize the container's surface. Another possible explanation is that some types of animals may be sensitive to the potentially toxic effects of corrosion-resistant coatings used on shipping containers. The team conducted a follow-up ROV dive in December 2013 to study possible effects of the container's coating. The samples from this dive are still being analyzed. Overall, the paper shows that the container caused shifts in animal communities through a variety of processes. 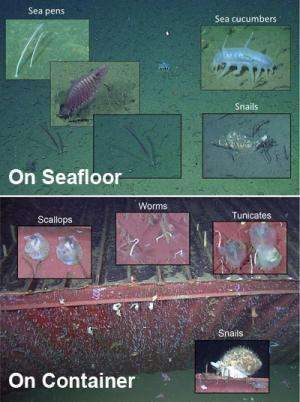 Its physical presence provided: 1) a hard surface that sessile (attached) animals colonized; 2) a physical obstacle that affected local bottom currents, 3) a high spot on the seafloor that attracted predators, and 4) a possible source of toxic materials. This collaborative research project has already helped government agencies in formulating standards for how containers are weighed, stacked, and lashed down. It has also spurred interest from both governmental agencies and the shipping industry in finding a way to track the number of containers lost at sea each year. As DeVogelaere noted, "The fact that our research was mentioned by the U.S. Coast Guard in the background material for a proposed lashing rule shows that this work has clear societal value."